Nourison is a leading resource in today’s floor covering market, offering an extraordinary selection of premium broadloom, roll runners, and custom rugs for virtually any style of interior décor. Comprehensive programs including handmade area rug collections such as Nourison 2000, to beautiful power-loomed carpets and stair runner collections representing an unparalleled level of luxury and sophistication in broadloom, area rug and roll runner construction. Prominent floor covering retailers rely on Nourison for merchandise assortments recognized for their unique combination of beauty, craftsmanship, and value. 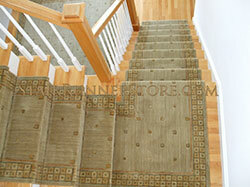 Nourison's fine products deserve the expertise offered by the “The Stair Runner Store” with installation and fabrication experience unparalleled in the stair runner business.